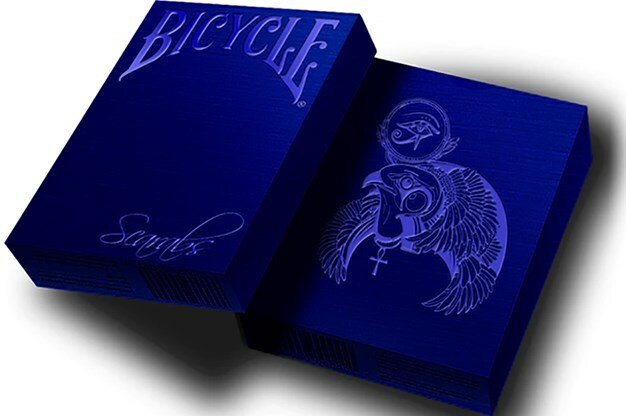 The Limited Edition Sapphire Scarab deck lifts the veil of death, exposing highly rendered details of the Egyptian rulers manifesting on the other side. The noble spirits illuminate the darkness, allowing the light to reflect off their gold adornments to reveal stunning hand-drawn details of these divine beings. Hints of iridescent sapphire highlight their jewelry and symbolize the heavens and bestow the power of rebirth upon ancient Egypt's most prestigious souls. All Sapphire Scarab cards are set against a stark black background, denoting the unknown and darkness of the afterlife. From building colossal pyramids to sculpting masterpiece sphinxes, ancient Egyptians were masters at executing the inconceivable, thanks to their extreme attention to detail. To honor their meticulous methods, the artwork of each Scarab deck pays homage to ancient Egypt's style and class. The incredible details of the Sapphire Scarab deck highlight the essence of life beyond the grave with shading and highlights that magnify the immortality of these royal beauties.